Go nerf at night. Take your battle into the darkness with the N-Strike Rev-8. Now you can take aim at your opponent anytime, anywhere, even at night. Launch nerf darts from up to thirty feet away. The rotating barrel holds up to eight darts. Just pull back to power up, squeeze the trigger, and fire. Blast away and watch the barrel burst with light as you send darts flying through the night. 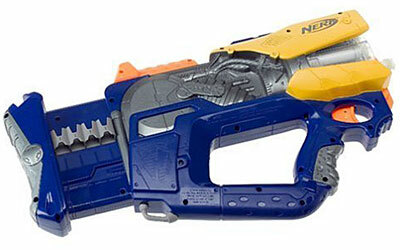 The N-Strike Firefly's barrel lights up when you pull the trigger and sends glowing nerf darts up to thirty feet away. Blaster comes with eight nerf darts, label sheet, and instructions.